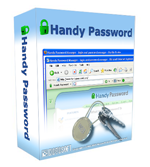 Handy Password is a multi-user password manager and an enterprise password manager which can be used in a corporate environment or at home by an unlimited amount of people allowing them access to the multi-user password database with different privileges. The multi-user password database can be accessed with either administrator rights or user rights. Read about other features of Handy Password or download password manager now to try the multi-user password feature for free within 30 days!